I finally saw Andrew Dominick's The Assassination of Jesse James by the Coward Robert Ford tonight at the AMC Empire 25 in Manhattan, and there was very nearly a riot outside the theater. Not because of Jesse James mind you. No it took me a while to figure out what was going on because I was afraid they weren't going to let us in, since they were starting to lock the doors and bring in the police. It turned out to be a sneak preview of Tyler Perry's Why Did I Get Married, which was sold out and causing unrest amongst the Perry fans who had been waiting in line for hours. It wasn't much better inside, as there were people on several floors without tickets trying to get in, to no avail. They were getting pretty rowdy when they closed down escalator and wouldn't allow anyone to go up at all. I must have understimated the zeal of Tyler Perry fans, but I had no idea the movie would be that popular. I doubt it will inspire such passion across the country, but will be a moderate hit. Perry has a very specific niche market (i.e. African American women), and it will do well with its target audience. But the point of all this is, despite the riot I had to fight through to see it, The Assassination of Jesse James by the Coward Robert Ford is a flat-out masterpiece. It is an essential American western, a film of such lyrical beauty and power that it is far too good for the treatment it is getting. Jeffrey Wells over at Hollywood-Elsewhere is calling it the most lauded, worst-treated movie of the year, over the fact that Warner Brothers will not be screening the film for critics in several cities as it begins its slow roll-out into the top 25 markets this Friday. This is the kind of treatment you give a film you want to hide - i.e. a second-rate horror flick or throwaway kiddie comedy that is going to haul in the family audiences no matter what you do. This is not the way you treat one of the best films of the year. There has got to be some kind of explanation for this, but I half wonder if the film is just too good. People just don't know what to do with it because it is so above and beyond. After all, Citizen Kane was beaten to death when it was released and look where it is now. It is a slow-moving film, probably too much so for a chunk of mainstream audiences. And there were a couple of walk-outs in the screening I was in. Which may explain the seeming tentativeness of how to handle the film by Warner Brothers. But if only people knew what they were missing. And they even have Brad Pitt to use as a marketing tool. This is a movie that deserves to be seen - and I think if people could see it and the word got out there, then maybe people would get out there and see it. 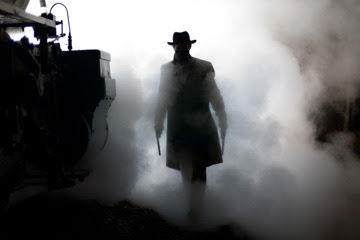 The word needs to be spread, it needs to be shouted from the rooftops - The Assassination of Jesse James by the Coward Robert Ford is a movie for the ages, a masterpiece without an audience. It is the best movie that no one is watching. Don't forget to enter my Jesse James contest, which will be up through October 31.